Life…it’s one big balancing act. We are all desperately trying to successfully fit school, work, friends, family, alone-time, sleep, and fitness into our lives. And let me tell you, speaking from experience, it is just about impossible. This is where the balancing act comes into play. 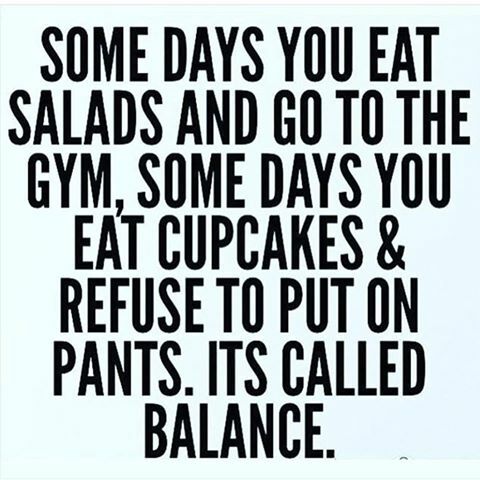 That’s right, some days you eat salads and go to the gym and other days you eat cupcakes and refuse to put on pants. It’s all about balance. Zorka Hereford gives a lot of good insight about balance in her article 5 Tips For Living a Well Balanced Life. She talks about how a well balanced life is essential for personal effectiveness, peace of mind, and living well. The sooner you come to the realization that the only way to fit everything into your life is by keeping a balance, the much happier you will be. Some personal tips that I have learned throughout the years that help me with my balancing act are having set times dedicated to certain things, that way you don’t forget about anything. For example, making time to do homework everyday during lunch hour and every night from 6-9, calling my mom everyday driving home from work to catch-up, eating dinner with my roommates just to spend some time with them, watching an episode of Grey’s Anatomy every night before bed to just give myself some time to unwind (people tend the underestimate the importance of alone time), getting at least 6 hours of sleep a night, and heading to the gym whenever I am able too. Having a certain structure to follow makes the whole balancing act a lot easier, I definitely recommend it. Another tip that I have for you is to not stress too much about things. Yes, it is incredibly difficult to keep up with this whirlwind that is constantly circling us, but RELAX! Sometimes you’re going to do bad on an exam, so do better on the next. Some days you are going to eat like absolute crap, so hit the gym that night. And sometimes you are just going to have an all-around off day, so make tomorrow better. IT’S ALL ABOUT BALANCE.